Quick Easy Fundraising From Each Student's Own Artwork! Raise money for school wide or grade level needs, PTO/PTA/HSA projects, booster clubs, art clubs, band trips, field trips and end of year activities. Raise money for your church or synagogue's latest project, ongoing youth group activities, community outreach,charitable sponsorship and summer camps. Raise money for club equipment, facility improvement, activities and trips. 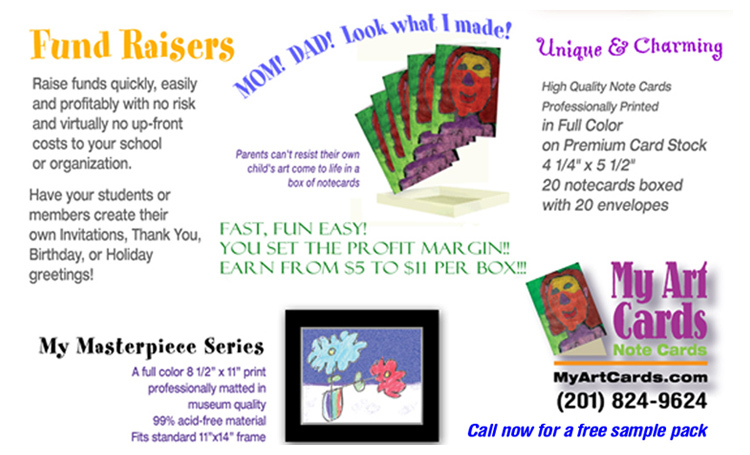 Organized groups of all ages and every type can benefit from My Art Cards fundraising. Raise money for personal, individual, non-profit and community causes. Your message explains and promotes your cause on the back of every card. What is My Art Cards? No risk or up-front costs. No deposit. No prepayment. No minimum order. You pay nothing until you have your proceeds in the bank. 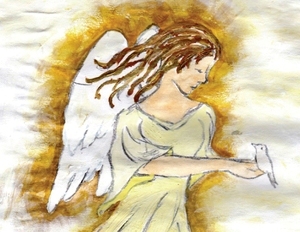 My Art Cards is quick easy fundraising with note cards printed from each student or member's artwork and sold to their own parents and friends. 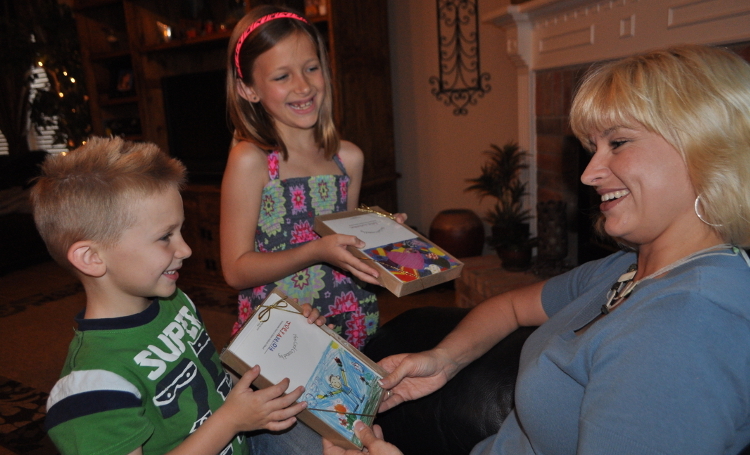 Who wouldn’t want a box of note cards created by a special person in their lives? My Art Cards practically sell themselves! "Hallmark quality" cards in beautiful gift box. 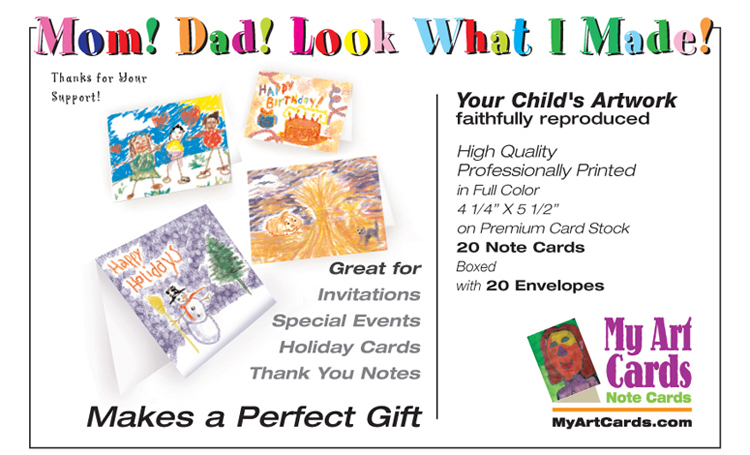 At My Art Cards, every participant’s art is faithfully reproduced and professionally printed in vibrant, full-color format on premium card stock. Each artist’s work arrives in a beautiful gift box filled with twenty 4-1/4 by 5-1/2 inch note cards and twenty envelopes which proudly displays their own artwork. Parents and grandparents love them! They make great gifts, too. 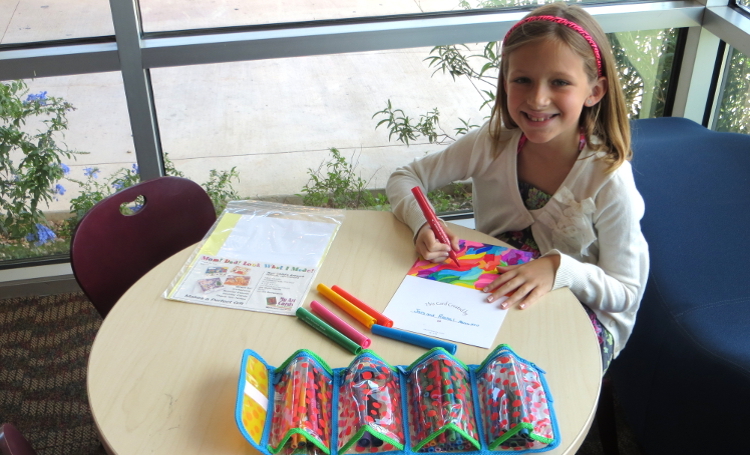 Kids (and artists of ALL ages) love to express themselves. 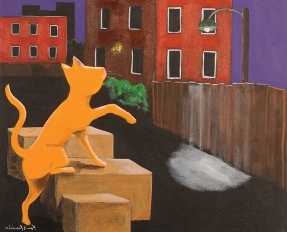 Everybody loves the sense of achievement and self-esteem that accompanies having artwork professionally published. With minimum effort, you can offer parents, relatives, your organization or your entire community a unique way to enjoy priceless, individual expression with no risk or up-front costs. 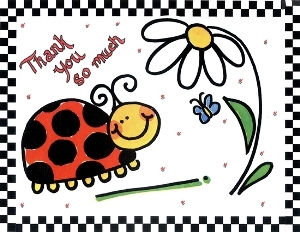 My Art Cards fundraisers do NOT require any door to door sales to be successful. This keeps your organization members safe and parents, grandparents, other family and friends are eager to participate. Focus on results, not paperwork. 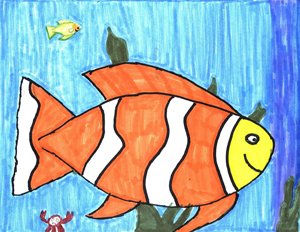 Whether your school or organization is large or small, My Art Cards fundraisers are a simple and proven way to raise funds. Our easy to follow checklist helps you plan and schedule your fundraiser from start to finish. The paperwork is minimal and straightforward. We’ll answer all of your questions – with no obligation or pressure – and will never ask for a deposit. But please do call soon to reserve prime press dates while they are still available. Add to your profit with My Masterpiece (no additional effort required). My Masterpiece is an 8-1/2 by 11 inch full color art print of your student or member's artwork digitally printed for long lasting quality on glossy, premium weight card stock. My Masterpiece is matted with museum grade 99% acid-free material and packaged in a clear plastic envelope. The finished My Masterpiece matted print fits any standard 11 x 14 inch frame and is sure to be a cherished keepsake.